SAPPHIRE Technology, has just announced plans to seriously address the motherboard market with the introduction of high end Intel platforms. SAPPHIRE has just released information that for the first time it will introduce Intel based mainboards in the high-end sector. Designed to appeal to the enthusiast, the first product will be a fully featured X58 board, to be known as the SAPPHIRE Pure Black X58, supporting the Intel core i7 series of processors. 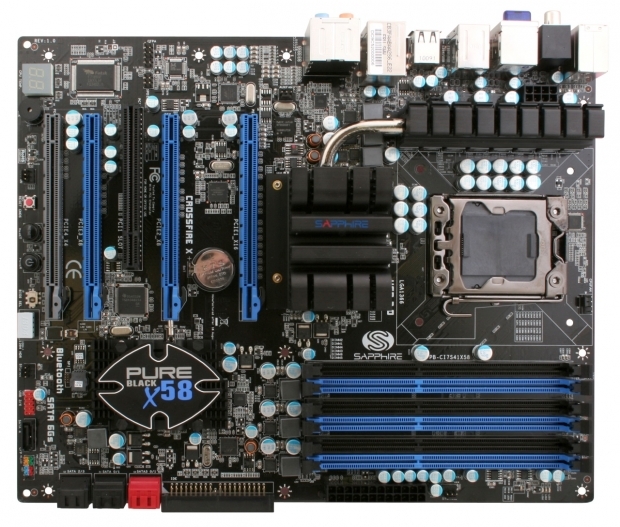 In addition to the established and highly regarded X58 chipset, the board incorporates many state of the art features such as on-board USB3.0, SATA III ports in addition to SATA II, Six dual channel DDR3 memory slots and 3 Gen2 (x16/x8/x8) and one Gen1 (x4) PCI-Express expansion slots as well as a host of peripheral connections and on-board 8-channel audio. Many enthusiasts are keen to performance tune this class of board and CPU, and the SAPPHIRE Pure Black X58 has many features to support 'overclocking'. The power sections are highly stable, featuring the same type of solid capacitors and the patented SAPPHIRE Diamond Black chokes with coolers that have featured on some of SAPPHIRE's high end graphics cards. Additional options are provided in the BIOS to help optimize settings, and start, reset and BIOS reset buttons are provided as well as a number of signal and voltage test points on the board in addition to a numeric LED status code indicator. A version of TriXX - SAPPHIRE's software overclocking tool - will give easy access to performance tuning and status monitoring.